Swordtails are fun fish to have. They breed fairly easily and they tolerate a lot of water conditions and temperatures. They do need a lot of room to swim around since they can grow pretty big, especially the very attractive males! You should definitely have only 1 male and several females, otherwise these randy fish will wear out their females pretty fast. These fish come in so many brilliant colors these days. You can choose between red, black, green, albino and even neon colors with multitudes of variations and combinations. A female swordtail can even appear to breed without the presence of a male! She is like a sperm camel. She can store enough sperm to fertilize six batches inside her own body, so even if you only take home one lonely female, you may very soon have a whole tank full of swordtails. Like all livebearers, their fry tend to become food, so you have to provide a lot of hiding places like dense areas of plants and crevices if you are going to leave them in the tank. That way they have a chance to grow big enough to live. Fry enjoy eating liquid fry food. If you want to further protect the fry, you can pull the female out just before she gives birth and separate her. You will have to remove her quickly when she is done because she will be hungry. The females look like they are about to burst right before the births. Their bellies will be so distended that you can actually see the little eyeballs of the babies through her scales! Swordtails are entertaining, spunky fish of a good size. 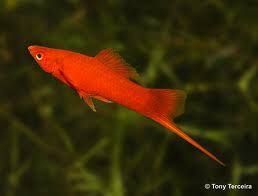 They enjoy the company of other swordtails and will perform mating dances that are fun to watch. They come in many colors with a variety of tail shapes so there is always something new to look for, especially when watching the babies grow. The perfect fish for younger aquarists, or those who want an easy, interesting community tank. As a fellow swordtail enthusiast could not agree more. Straight and to the point, well written. One additional comment might be, they eat about anything you throw at them fresh frozen, flake, freeze dried or pellet. Join in and write your own page! It's easy to do. How? Simply click here to return to Good First Freshwater Fish.